First things first: I am not a linguist and I am not a geographer/ cartographer. I am a physicist who is in dire need of a stress reliever. Mapping this is therapeutic while in the thick of preparing a manuscript for submission. Yup, the paper is now submitted and the anxiety level just went up in anticipation of the review. I probably can map the whole of Indonesia´s and Malaysia´s now! This map is my rendering of data used by ref  where they propose an algorithm whose goal is to reconstruct the ancient proto-Austronesian language. 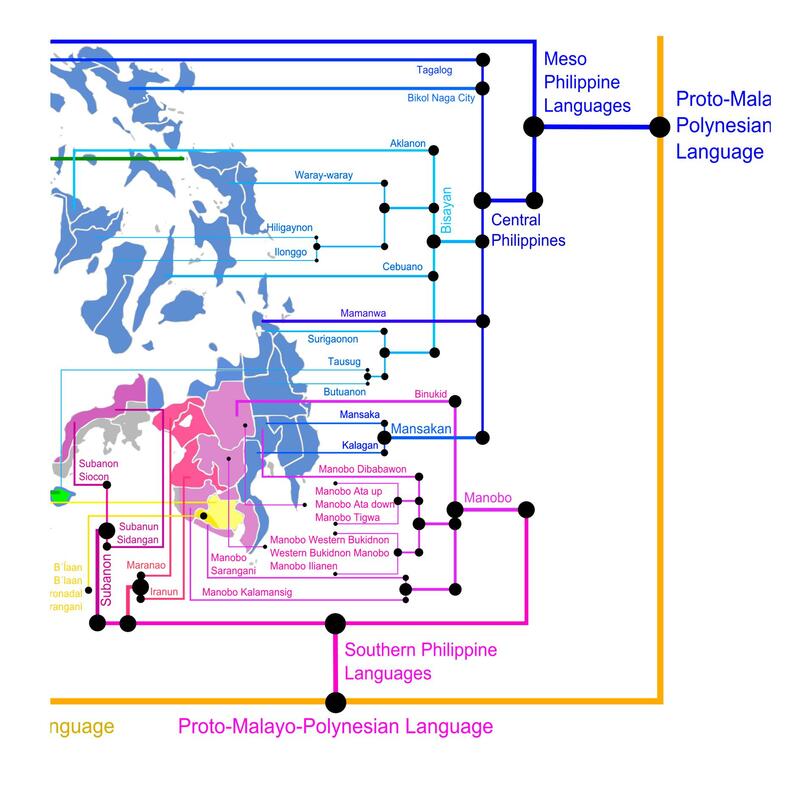 The proto-Austronesian language gave birth to the modern Austronesian languages. Comprised of 1000 to 1200 languages, the Austronesian language family is the largest language family in the world. Geographically, it is spoken from Madagascar to the Easter Islands, and as far North as Taiwan and Hawai’i, and as far South as New Zealand. 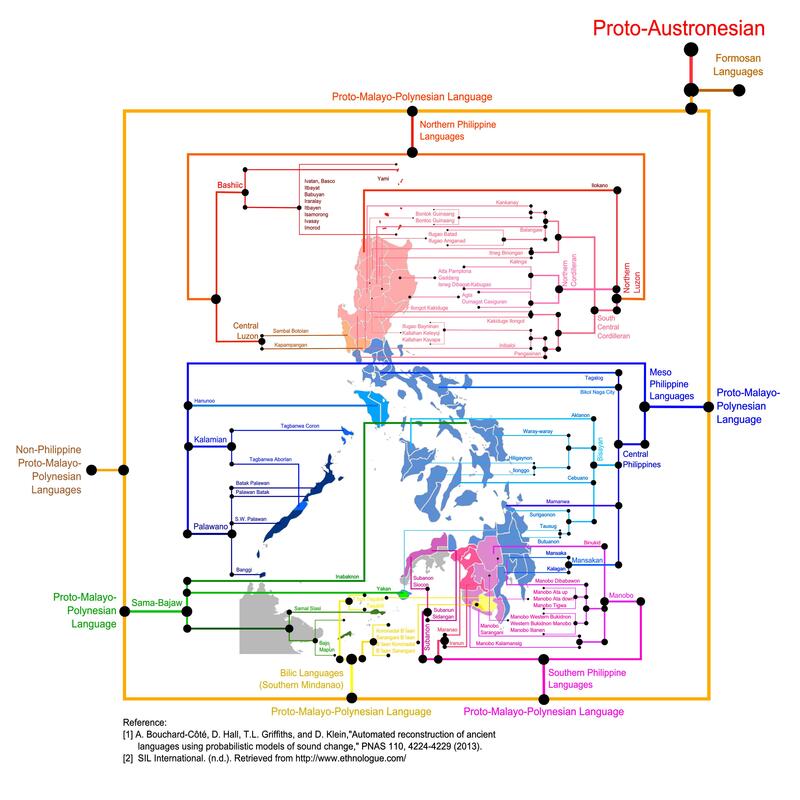 The languages of the Philippines are part of this large family. The authors of course, tested their algorithm with what the Linguists have and they say that their reconstructed relationship between languages does not differ much from what the linguists have obtained. They just have a different goal when they study the language relationship. I specifically chose the results of the paper above because it listed 77 languages from the Philippines, the most number in recent studies about the Austronesian languages. 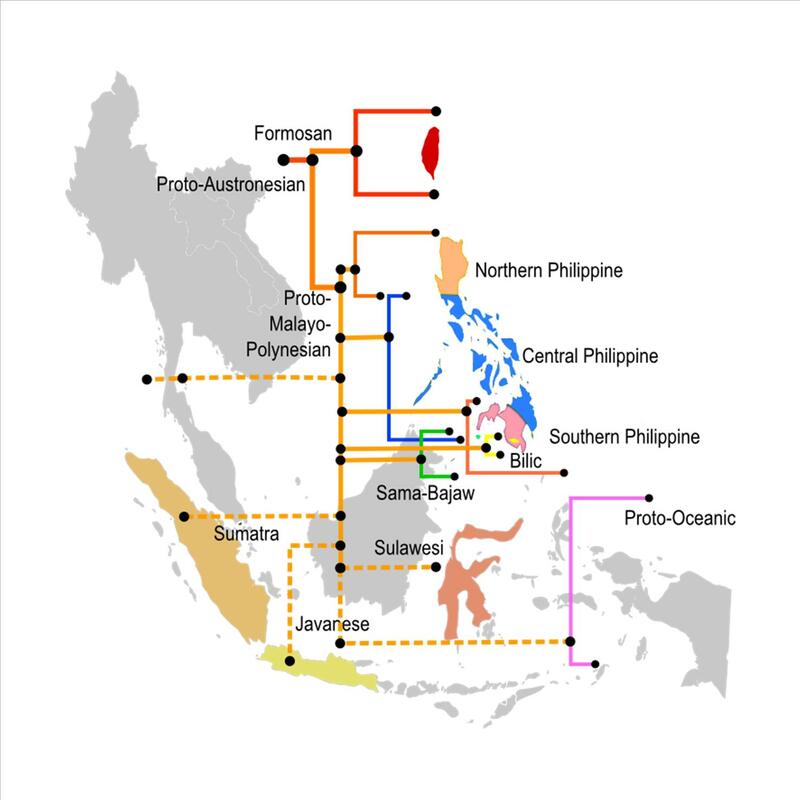 I will be writing a post or two about the Austronesian languages with the paper above and three or four more papers which study the Austronesian languages and societies. What´s the occasion? It´s my birthday week! I always wanted to write a post about these papers but I can´t find time. I am doing this as a birthday gift to myself. In this post, I write how I made the map and a somewhat guide to understanding its details. Let´s start with the concept of the Phylogenetic tree. Relationship between languages in the paper was drawn as a phylogenetic tree which I retained in my rendering. A phylogenetic tree is a concept in evolutionary biology. It is a branching diagram showing the inferred evolutionary relationships among various biological species based on similarities and differences in their physical and/or genetic characteristics [wiki]. Since languages also evolve, one can make a tree that represents the relationships between the languages. I will not discuss in detail on how they determine the lengths of the branch but it is based on mutation probabilities of the languages (read: probabilistic model of sound change at the level of phonemes). The first thing I did is to sift through the whole phylogenetic tree that the paper presented and choose all the branches with Philippine languages. 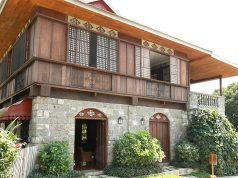 It is quite easy as the Philippine languages are well connected to each other. I’ve found 5 Philippine groups whose parent language is the Proto-Malayo-Polynesian (PMP) language. These are: the Northern Philippine Languages, the Meso-Philippine Languages, the Southern Philipppine Languages, the South Mindanaon or Bilic Languages, and the Sama-Bajaw Languages. Then I measured and assigned values for the branch length. The lengths are translated into node sizes in my map. The translation gave me the flexibility to move the position of the labels/languages for aesthetic reasons. (I know that it is not as straight forward as seeing lengths to denote distances but I make sure that I placed the node such that it is almost relatively similar when the length is used.) The bigger the node, the closer it is to the PMP branch. The smaller it is, the farther the language to the PMP branch. The thickness of the line, which depends also on the node size, gives the relative closeness of sibling languages. For example, Aklanon and Cebuano are farther separated from each other than Hiligaynon and Ilonggo, and the separation of Hiligaynon and Iloilo is similar to the separation of Tausug and Butuanon (see map below). Node sizes indicate the closeness of the language to the base language and within each other in the branch. Click to enlarge. As much as possible I like to be accurate in pointing where the languages are spoken. But is has been difficult because: 1) I don’t have data on where the people speaking these languages are exactly, and 2) there are overlapping regions and my resolution is only at the provincial level. The good thing is that languages in similar branches tend to be geographically near each other. This allows me to give a particular color to certain branches in certain regions. I chose to color only those branches with many subbranches, for instance, the Subanon, the Manobo, and the Marao-Iranun branches are colored differently. There are exemptions like Inabaknon and Tausug Jolo. These languages are “geographically odd”. I initially thought that I made a mistake mapping them. Sometimes you will see that I bunched up many languages in one bracket (e.g., Manobo Ata up, Ata down, Tigwa). This means I cannot really pinpoint their exact location or they have the same location, or they are closely related. I signify that I made a bracket if you see that my end point has a node. 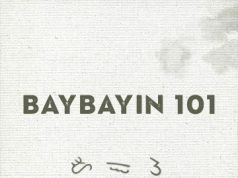 I made this for the languages in Batanes, the B’laan languages and so on. Please comment below if I miss anything that is worth explaining or I did something grossly wrong in the map. I welcome comments. Some sibling languages of the Philippine languages. How many of you were taught that our set of languages is a subset of the Indonesian or Malaysian languages? Raise your hands. So far, science is saying that this is not true. There is no empirical fact (yet) that says our languages came from them. We have “similar” languages because the languages came from the same parent language. The Indonesian and Malaysian languages are siblings to ours. I also made a rough map on the relative position of the Philippine languages with some languages in Indonesia and Taiwan based on the phylogenetic tree in  (the map above). If you like the maps, share them, use them, or improve on them. Just cite properly the references I used. But please do not use these maps to discriminate between peoples or use as an empirical data about language superiority over another. Let me be clear that I neither believe in the concept of race nor the superiority of one language from another. New knowledge reframes our consciousness, always.